Above, a knitting machine for modern fabric. Photo courtesy of Colette Patterns. Women of my mother's generation remember Stretch-n-Sew, the definitive way to sew the "new" knit fabrics that were emerging in the 1960s and 70s. From what I gather, the technique was done just as it sounds: you stretch the fabric as you sew. Without a doubt, sewing with knits does require slightly different techniques than working with woven fabric; whether strech-n-sew covers it, I don't know. For years, my fabric of choice was a knit, most likely one of the many lycra blends I picked up and used in my garments. It's stretchy, so no need for button or zippers, drapes nicely, and fits snug. More recently I have fallen in love with cottons and their tailored construction, and I am slowly opening up to the wide array of choices that are out there. Aside from discovering that different fabrics should be used for different projects, I have also realized that different construction techniques are also necessary. To account for shrinkage on cotton knits, buy an extra 1/4 yard for every 2 yards of fabric. Machine wash and dry once or twice before cutting. If you purchase a wool knit that you cannot wash, steam it before cutting. Often times, the selvadge of knits is glued together. What this means for you: the fabric will be warped and stretched out of proportion. To solve this and get the fabric to lay flat, cut the selvadges off before pinning and cutting your pattern. To avoid more stretching as you cut, place the entire fabric on your cutting service so that the ends are not hanging off the edge of the table and stretching the fabric. You can fold the ends on to the table if necessary. The nap is also important on knits, as it stretches differently from side to side than up and down. Make sure you pay attention to the nap guide on the pattern pieces as you lay out and pin your pattern. If you are getting slipped stitches when sewing knits with a universal needle, try a ballpoint needle on your machine. For more information on needles check out Getting Started. For any project, I recommend European thread brands like Mettler or Gutermann. Unlike many other branks, Guternmann thread is made from cotton rather than polyester, which may provide durability and be of better quality. For knits, however, they also have a polyester thread, which has more stretch for knit fabrics. Wind the bobbin slowly. When running the fabric through your machine, don't pull it from behind. This will cause your seams to be stretch out. To keep your thread from breaking as the garment stretches, it is best to sew seams with a zig-zag stitch if you don't use a serger. Even very slight zig-zags which are less detectable can give your garment the stretch you need. Set your machine on zig-zag and turn down the zig-zag height until it is almost a straight stitch. You can also do two stitches forward, one backward to give your seam some stretch instead of using a zig-zag stitch. Shoulder seams and other seams that bear the weight of the garmet may tend to stretch out over time. To prevent this, sew a strip of clear elastic in with the seam. To do this, first prep the elastic by stretching it out as full as it will go three times. Then, without stretching the elastic, position your elastic along where you are going to sew the seam, with both pieces of the garment as usual, with right sides together. Sew in place using a small zig-zag stitch. 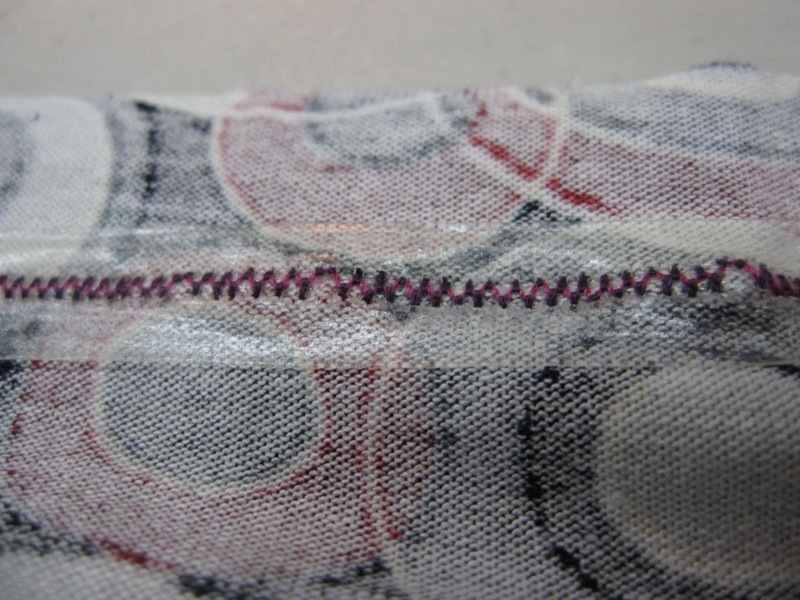 You can then finish the raw edge as you normally would, or use a serger to stitch the elastic on. For this technique, you can also be use the extra selvage of the fabric instead of elastic. Press the seams lightly with steam. Too much back and forth motion of the iron will cause the fabric to look shiny. Topstitch hems with a double needle. The bobbin thread zig-zags, giving the seam its stretch. Alternately, because knits don't ravel, the hem can be left unfinished. Use a tricot interfacing that will stretch with your garment. Stabilize the zippers and buttonholes with interfacing or extra layers of fabric. For more techniques, you can also check out my musings on knit hems.